The quilling below was made by my grandmother, may she rest in peace, Mrs. Effie May Walters Burton of Chillicothe, Missouri. Quilling or paper filigree is an art form that involves the use of strips of paper that are rolled, shaped, and glued together to create decorative designs. The paper is wound around a quill to create a basic coil shape. The paper is then glued at the tip and these shaped coils are arranged to form flowers, leaves, and various ornamental patterns similar to ironwork. 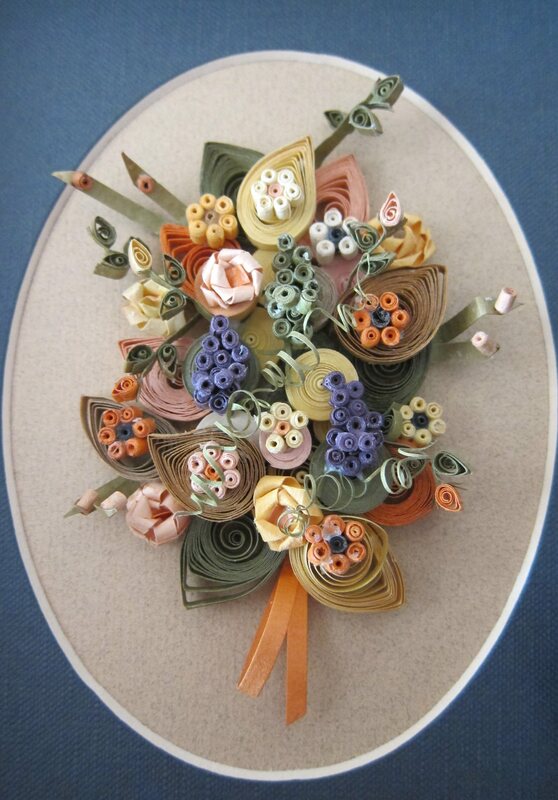 During the Renaissance French and Italian nuns and monks used quilling to decorate book covers and religious items. The paper most commonly used was strips of paper trimmed from the gilded edges of books. These gilded paper strips were then rolled to create the quilled shapes. Quilling often imitated the original ironwork of the day.